Once again on Monday, January 21st, members of the Milton community will join to celebrate the life of Reverend Dr. Martin Luther King Jr., a civil rights leader who fought daily to bring equality to all Americans. It is fitting that this annual event is sponsored by the Milton Interfaith Clergy Association (MICA) because Dr. King would have appreciated the effort to bring all members of the community together. I have asked Barbara Wright, Head of the MHS Humanities Department, to share some history below. 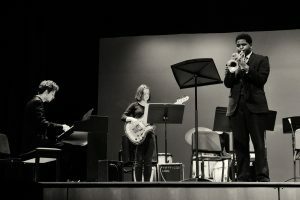 The members of MICA invite every citizen to join in their annual celebration, and the Milton Public Schools is proud to be part of the celebration. 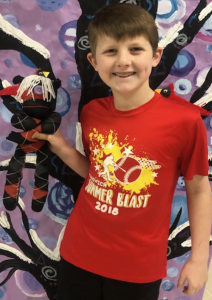 Our elementary students, as well as our high school choir, sing each year and artwork from students from kindergarten through twelfth grade is displayed throughout the Concord Baptist Church. In a most generous gesture, MICA also recognizes and sponsors four Milton High School students to represent Milton at the YWCA’s Youth Initiative Leadership Program (known as INIT), a school-year program where students meet on weekends and work with students throughout the greater Boston area and the INIT staff to plan and implement a service project for the students at Milton High School. 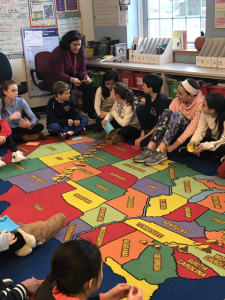 In the past our students have celebrated diversity, hosted difficult conversations on race and religious inequality, and invited the entire community to come together to talk about ways our town could welcome all its members. Without the generosity of those who attend the Dr. King celebration this amazing opportunity would not be available for our students. 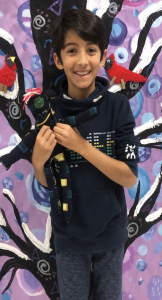 The current INIT team – those students who won the art/essay contest last year and are currently working on their service project – are juniors Maggie Haley, Catherine Le and Alisa Lorden and senior Damauri Fox Portis. Their project will be presented in the spring. 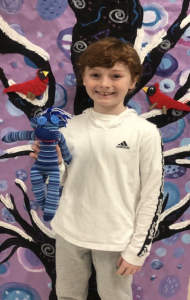 This year’s winners, who were chosen as part of an art and writing contest, are sophomores Anna Fahy, Connor Foley, Grace Kelly and freshman Caroline Gannon. This year’s theme is – Our lives begin to end the day we become silent about things that matter, a sentiment Dr. King expressed the day after Bloody Sunday. In 1965, when the Civil Rights movement was becoming more prevalent in southern cities, Dr. King and about 600 citizens (including current Georgia Congressman John Lewis who was only 25 at the time) planned a march from Selma, Alabama to the state capital in Montgomery more than 50 miles away. On the first day of the march they were attacked by Selma police and Alabama state troopers who told them they were not allowed to protest on the streets of Alabama. Film crews videotaped the violent confrontation and within hours people from all over the United States watched. The marchers walked for their right to have a voice through voting, but their voices became more pronounced after public outcry, and within a few days there were marches in more than 30 cities throughout the United States. In many ways those protesters – who refused to remain silent – stirred a nation into action. It’s important to understand that in a democratic society the voices of the people are the most important, whether they gather to implement change or to celebrate. On Monday MICA and the Milton community will use their voices to celebrate. The celebration is held at the Concord Baptist Church at 180 Blue Hill Ave, and will run from 6:30 to 8:00 pm. All are invited to attend. In an ongoing effort to identify potential short and long term solutions on our space and enrollment issue, the School Committee hosted an extended Citizens Speak at their meeting on January 16th. DRA also presented additional information, including cost estimates on various options, to the committee. The presentation was informative and interactive as School Committee members discussed possible solutions. I urge all Milton residents to take the time to watch the recorded version of the meeting, which is available on Milton Access TV, as are all School Committee meetings. On Wednesday, January 23rd at 7pm, there will be an Open Forum on Space and all are invited to attend and participate. The January 23rd School Committee meeting will be held in the Cunningham School Library. Please note that unlike Citizens Speak, the Open Forum will allow the opportunity for an exchange between citizens and Milton School Committee members. All are invited to attend and participate. 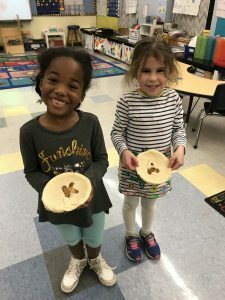 Kindergarten Information Night: On January 24th, at 6:30 pm, we hope to see many kindergarten parents and guardians at Milton High School for Kindergarten Information Night. As we prepare to welcome our new kindergarteners next September, the first step for families is to pre-register your new student. Pre-registration is live on our website. Please note that your child must be five years old on or before August 31, 2019 to start kindergarten in September 2019. Preschool: Preschool pre-registration is underway. 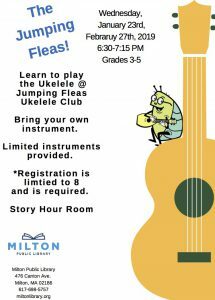 Families who are presently residing in Milton with children age three on or before August 31, 2019 for the half day programs and children who will be four years of age on or before August 31, 2019 for half and full day programs are invited to complete the pre-registration. Please review the program overview, MPS program fact sheet and important preschool dates. If demand exceeds availability, a lottery will be held on January 25th. Any family who has completed the pre-registration by Thursday, January 24th will be included in the lottery. Families pre-registering after January 24th will be awarded a seat based on availability or added to a waitlist. If you have any questions please email Marti O’Keefe McKenna or call 617 980 7343. For preschool special education and evaluation questions please email Jayme Szymczak. 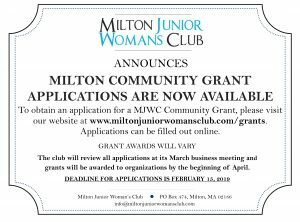 Each year the Milton Foundation for Education supports teachers’ creativity by offering teacher mini-grants. MFE Teacher Mini-Grants provide valuable funding so that teachers can enhance their work in the classroom. 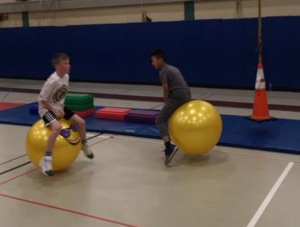 Inspired by a recent workshop, Pierce physical education teachers, Mr. O’Leary and Ms. Queally, submitted an MFE grant to purchase “Hippity Hops” for the PE classes. 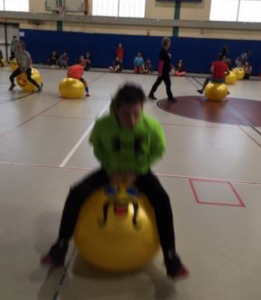 It has been found that hippity hops can greatly enhance fitness as they require little skill, support many components of fitness, and are just plain fun! A special thank you to the Milton Foundation for Education for supporting our teachers’ creativity. Mrs. Chen’s Cunningham 5th graders know how to appreciate the small things. The best birthday gift? Kind words. 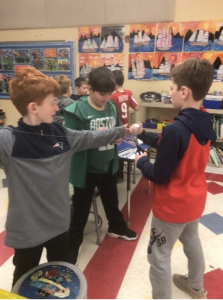 For every student’s birthday, classmates write birthday compliments and share them with each other at the beginning of class. This well loved class tradition has helped to foster a kind and inclusive classroom. 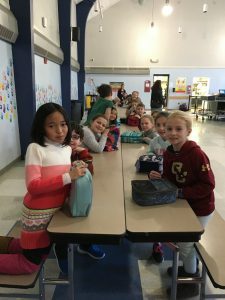 Last Friday, Glover 3rd graders mixed it up at lunch in response to our Positive Behavior Incentives and Supports (PBIS) initiative, as well as our Social Emotional Curriculum. 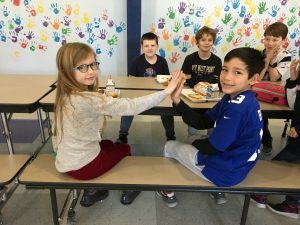 During lunch, students were asked to move to another spot in the cafeteria, away from the typical friends they sit with, while music played. When the music stopped, students sat down. This was repeated three times to ensure students were well mixed! 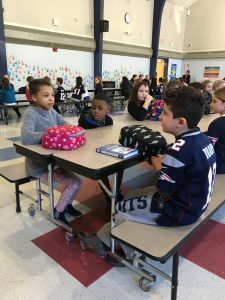 Once their final spot was chosen, Principal McDavitt and Assistant Principal MacNeil facilitated the lunch, helping students to connect, ask each other questions, and find similarities. The multiple opportunities to switch seats and make new friends created fun for all! 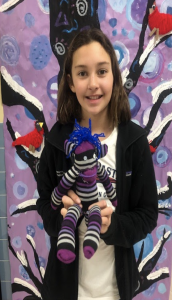 Collicot 5th graders are wrapping up a fabric arts project in the art room by making their very own sock monkeys. 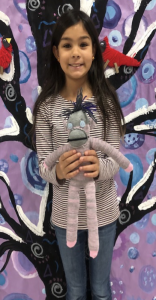 Thanks to generous funding by the Collicot PTO, students learned and applied the basic steps to hand sewing by threading a needle, tying a knot, using the whipstitch and adding stuffing to make these adorable monkeys. Do you know what youth addiction looks like? 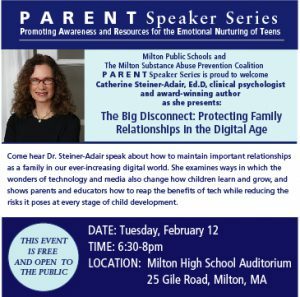 The Milton Substance Abuse Prevention Coalition, Milton Public Schools along with the towns of Milton, Dedham, Quincy, Randolph, Braintree, Stoughton and Canton are bringing back Drug Story Theater for a community presentation of “The Price You Pay: Second Chances” on Tuesday, January 22nd at 6:30pm at Milton High School. 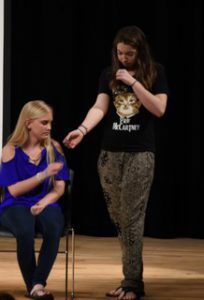 This play was seen in October, 2018 by Milton High 9th and 10th graders, and you could hear a pin drop. 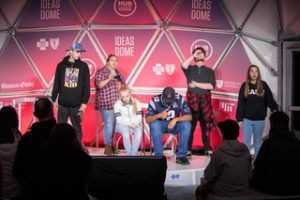 Principal James Jette said he was “thrilled with the performance and feedback from our students.” Our showing of “The Price You Pay: Second Chances”, is a unique collaboration between Milton and the surrounding towns. This event is free and there is ample parking available. 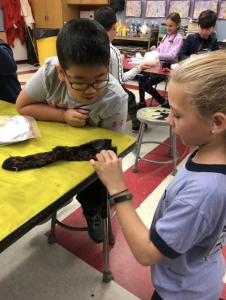 Did you know that the Milton Public Schools earns funds for every pound of textiles that is donated in the Bay State Textile bin in the back of each of our schools? 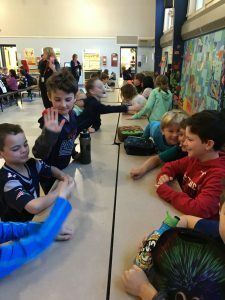 Since June of 2014, the six schools have collectively received almost $12,000 to support enrichment activities and supplies in each school. If you are cleaning out your closets and do not know what to do with your bags of tattered clothes and textiles, we encourage you to donate them in the bin at the back of each school. 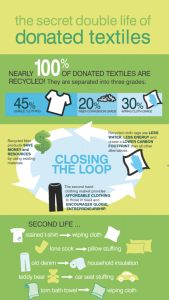 We know many of you donate your gently used clothes to important causes such as Cradles to Crayons. But what do you do with those clothes that your children have “lived in” a bit too much? Please consider placing them in the textile bins. Many items that you can not easily dispose of can be placed in the textile bins – including stuffed animals! It’s the environmentally responsible thing to do and also earns valuable funds for each of our six schools! 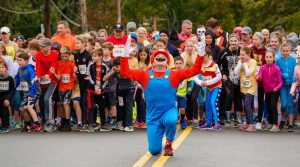 Super Mario starts the Monster Dash! Even though it has been mild to date, the winter season is upon us. Please review our Winter Weather/Snow Day communication. Inclement weather is a part of life in the northeast and the better we manage these challenges as partners, the more successful our winter will be. Hillary Wong, MPS Dietetic Intern, would like to extend her sincere gratitude to the MHS community for supporting the recent sock drive. Due to the generosity of the students, families and faculty, the Sock It To Me Sock Drive was a huge success. 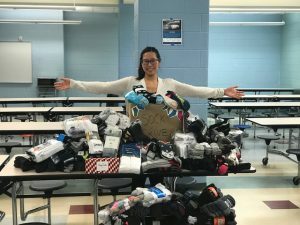 The outpouring of donations from Milton High School provided 505 pairs of socks to the homeless men and women at Father Bill’s & MainSpring Homeless Shelter in Brockton and Quincy. By donating to Father Bill’s, you have enabled them to continue in their mission to support the basic needs of families and individuals, making a difference in their lives. Thank you again for your generous support! MPS Food Services would like all federal employees affected by the shutdown to know that anyone can apply for school lunch benefits at any time. Please reach out to Jackie Morgan at jmorgan@miltonps.org with any questions. Application and details can be found here. 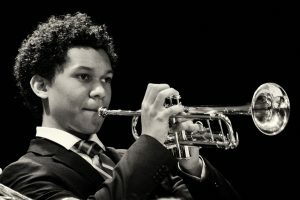 Junior District Audition results are in! 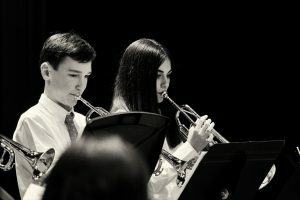 Congratulations to Pierce and Milton High School students who auditioned this past weekend and were selected to perform in the Eastern District Junior Festival. 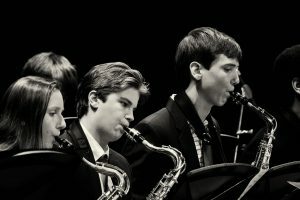 These students will participate in the two-day festival sponsored by the MMEA- Eastern District in early March. Well done to all who participated! On Wednesday this week, MHS Senior Julia Nerenberg performed a recital on lute, marking the completion of an independent study. Over the past semester, Julia researched the history of the lute, taught herself to read French and Italian tablature, and acquired mastery on the instrument. 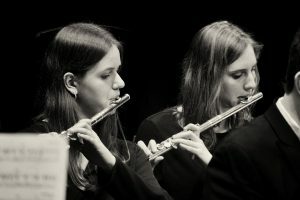 Julia is co-concertmaster in the MHS Orchestra and has performed on lute with the Chamber Ensemble. You can see her performance here. 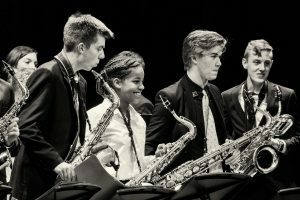 Finally, if you did not get a chance to catch the Winter Jazz Night concert this week, please enjoy these clips by the Pierce Middle School and Milton High Jazz Ensembles: Pierce MS Jazz Ensemble: Uptown Funk , MHS Jazz Ensemble: Stormy Weather, Winter Jazz Night Finale. Thank you to MPS parent John Gillooly for the images below. 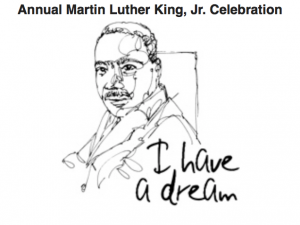 There are several MLK Day Service Projects taking place in Milton on January 21st. It would be wonderful to see many MPS families at these volunteer events. For the indoor service project, you are invited to donate, assemble, and distribute Blessing Bags to homeless individuals. For time, location, and sign-up, Click Here. For the outdoor service project, you are invited to help clean up litter from the trails of the Boston Nature Center and Wildlife Sanctuary. For time, location, and sign-up, Click Here. On Saturday, February 2nd at 7pm Milton Community Concerts and First Parish of Milton are proud to present a rare viewing of the silent film classic, Charlie Chaplin’s “The Kid” with live improvised organ accompaniment by virtuoso organist Peter Krasinski. This concert celebrates the 60th anniversary of the Wigglesworth Memorial Pipe Organ at First Parish. Tickets (at door only) are $25/$15 seniors/Free 18 and under. On Friday, January 18th, the Boys Basketball Team takes on Walpole High School in what will be called the “Snowbowl”. Join us in recognizing Derrick Snowden, MHS Hall of Famer, for his 30th year of service to the Milton Public Schools. He has been one of the biggest supporters for the Milton High School Football and Basketball Teams as the “man behind the mic”! We will also be holding a sock drive during the game. Admission is $5 for adults and $3 for students and senior citizens. For free admission, we ask that you donate at least one new pair of men’s or women’s socks (wool or cotton work best). All donations will be sent to a local homeless shelter. Grace Long, Freshman, Ice Hockey: The Girls Ice Hockey Team is off to a slow start in a rebuilding year with Grace Long as one of the brightest on the team. Grace has scored 6 Goals and 5 Assists for a total of 11 points. She has played a part in a 11 of the 14 goals. Grace is a skilled player that makes her teammates better around her. She is a team player and very coachable. She has a great attitude and a leader on the team as a Freshman. Grace has double the points of the second leading scorer on the team. Austin Wright, Senior, Wrestling; Austin is one of the senior captains. He exemplifies what it takes to be a true leader and captain. He leads by example always one of the first to practice and last to leave. He teaches new wrestlers and encourages the veterans. He has a very solid 7-4 record wrestling in a very tough weight class 138lbs. His pin in the Weymouth match was one of the most dramatic of the season and which helped the Cats of Milton beat the Cats of Weymouth, 42-36. 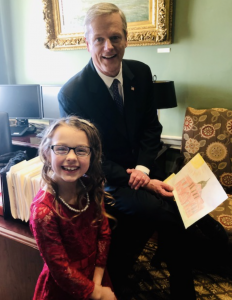 Student: Cunningham 2nd grader Sophia Casini, who has collected thousands of pairs of socks for homeless men and women through her annual December sock drive, was invited by Governor Baker to do the Pledge of Allegiance at his inauguration. 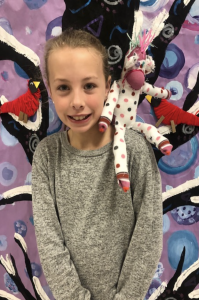 Mrs. Casini shares that it was an amazing day for Sophia and her family and that Sophia plans to continue her annual sock drive for years to come. You can watch Sophia lead the Pledge here. 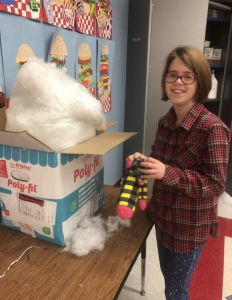 Congratulations to Sophia on a job well done! 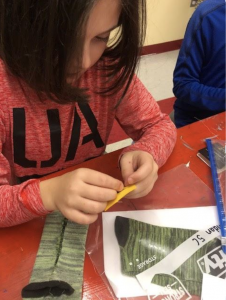 BLOG SUBSCRIPTION If you do not receive the Superintendent’s Weekly Update and would like to, please enter your email here to subscribe to this one weekly email.